move the same dirt twice. degree turn will add interest. additional fall in the stream bed even if you don't have a turn there. In this case, you will need to elevate your filter box. surface. Also, cinder block is 8" tall when laid on it's side, so it makes it the perfect hight for most waterfall applications. DO NOT START DIGGING!! THIS IS VERY IMPORTANT! DO NOT START DIGGING!!! phone line runs under your waterfall, that's o.k., just don't plan on digging your POND in that spot. out from the filter box later. 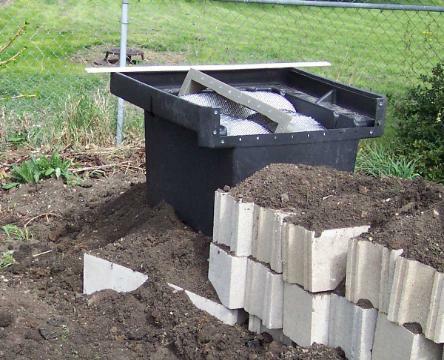 Don't even WORRY about the skimmer box until you get the pond dug and the liner installed. Just be sure you have enough 2"
flex PVC to make it from the filter box to your proposed location for the skimmer. O.K., it's time to start digging! !